The absolute universe is one. Then two opposing forces appeared, and the relative world was born. In the orient this dualism is called 'yin' and 'yang', in the west, 'plus' and 'minus'. If you hold a wooden staff with a tight grip and try to raise it overhead, it feels quite heavy. If you hold it lightly it feels light. In the same way you should not approach things with too serious an attitude. Take a lighter point of view. In other words, think positively. Even if you learn something quickly with your conscious mind, you will easily forget it after you stop practicing. That which is learned with the subconscious mind is not easily forgotten. Therefore to learn something with the subconscious mind, requires months and years of training. Just because you were able to do it before, do not assume that you can do it as well the second time. Each time you do something, you must return to your beginner's mind, and give it your best. Until you change the sub conscience mind, you cannot say that you have learned something. If something is worth learning, you should stick with it until you have changed your subconscious mind. Let us have a universal spirit that loves and protects all creation and helps all things grow and develop. To unify mind and body and become one with the universe is the ultimate purpose of our study. Selfish people have never understood and travelled the way of the universe in the past. Therefore when we realise the principles and the way of the universe, the universe gives us the responsibility to spread them to the world. Do not think that you cannot help another person. What you learn today, you can teach another the next day. The world is full of people who have lost the way of the universe and suffer illness. Let us do our best to explain the correct principles of the universe to them. The ki of the universe is absolute. There is no such thing as strong ki verses weak ki. Correctly speaking, ki is strong only because it is strongly extended, weak only when it is not extended strongly. There is no limit to how strong your ki can become if you train yourself to extend ki strongly. Ki tests are not founded on the idea of testing for strength or weakness. The most important factor in ki testing is to accurately inform the person of the state of his or her mind. Thus, the person performing ki tests must truly understand and exhibit oneness of mind and body from the outset and then perform the tests correctly. Some people are quick to find reasons and excuses why they cannot do things. This cuts their Ki and in times stifles their motivation altogether. Motivation is extending Ki, not receiving it. People today are more concerned with what they can get, than what they can give or do for others. That is why they cannot extend Ki. When learning something new, you must never be critical at the beginning. Always do your thinking after trial and error. Most people make up their mind one way or the other before they even get started. The most important step is to remove your coloured glasses and get a clear view. We call the mind that wants to make the way of the Universe clear and to put it into practice the mind that seeks truth. However clever a dog or a monkey may be, they cannot realize the universal mind. Only human beings have the privilege and capacity to realize it. If you have a mind that seeks truth, you are happy because this is the proof that you are a real human being. We are blessed with a spirit that is one with the spirit of the universe. This spirit is called "reiseishin". The moon is clearly reflected in the water when the water is calm. In the same way when our mind and body are unified and calm, our "reiseishin" manifests itself completely. Once this happens all suffering and wicked desires fall away, and the universal spirit of love and protection for all things appears in us. Let us strive to realise our "reiseishin". Just as tops spinning violently and rapidly becomes steady, the most rapid movements results in calm. Like the eye of the typhoon, which, is always peaceful, inner calm results in great strength of action. Calm and action are exactly one. Only when we keep our one point and unify our mind and body, can we find spare time even when we are busy. Keep a calm mind and you will be able to perform to the best of your ability, even in an emergency or when facing important tasks. Ki is a very complex word... and even more difficult to translate to westerners. The absolute universe is one. We call this ki. Our lives and our bodies are born of the ki of the universe. Study thoroughly the principles of the universe and practice them. We are one with the universe. There is no need to despond, no need to fear. The way we follow is the way of the universe, which no difficulty nor hard-ship can hinder. Let us have the courage and say, "if I have a clear conscience and a calm spirit, I dare to face an enemy of ten million." True "fudoshin" is not a rigid, immobile state of mind, but the condition of stability, which comes from the most rapid movement. In other words, like the steadiness of a spinning top, the state of perfect spiritual and physical stability arises from movement, which continues infinitely and is so infinitely rapid that it is imperceptible. There is no conflict in the absolute universe, but there is conflict in the relative world. If we unify our mind and body become one with the universe, others will follow us gladly. Do not say that this is a world where we must struggle to live each day. The true way to success is exactly one and the same as the principle of non-dissension, and that is the way of peace. When you teach people it is useless to try to change their character. Correct their bad habits first, then their true character can come through. Teachers must have a positive mind. If their attitude is negative, it infects their students. Students cannot learn from bad examples until they develop their own powers of judgement. Our lives are born of the Ki of the Universe. Let us give thanks for being born not as plants and animals, but as human beings blessed with a Universal Mind. Let us pledge to fulfil our missions by helping to guide the development and creation of the Universe. Until you can clearly make up your mind, you are better off not doing something. Make a habit of being decisive in your daily affairs. Some people can be heard to say, "what will I do if I get killed?!" If you die, there is nothing you can do. Whatever you have to do, do it now, while you are still living. You must practice to be able to return to essential principles at any moment. 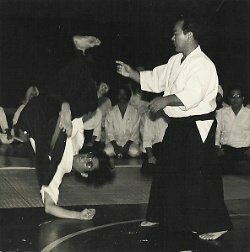 Bio: Koichi Tohei was a 10th Dan aikidoka and founder of the Ki Society and its style of aikido, officially Shin Shin Toitsu Aikido, but commonly known as Ki-Aikido.